As usual, in the aftermath of a mass shooting, Obama shot his mouth off. ... Obama, is first and foremost, a community organizer. What do community organizers do...they cultivate a grievance in a community into anger and direct that associated rage to motivate people to accomplish a political goal. That is what he is doing. He's a social justice warrior at heart, that is what motivates him to get up in the morning. He believes that inflaming a certain community into action is going to allow him to accomplish his goals as a SJW. He has no use for peace and people coming together, you don't accomplish radical change unless people are properly motivated to push for that change. Look at how he responds to diverse incidents. If it is advantageous to his goals and fits the template, he's out within hours making statements to reinforce his social justice narrative. If the incident is counter productive to his goals as a SJW, (Orlando, this Dallas shooting) he urges great restraint and caution until an investigation can determine a motive. It's not random, you fan the flames to help your cause and you depress sentiment that is counter to you cause. I took the Bontrager H2 semi-slicks for an inaugural ride late this morning in Valley Green. My ride today was only 6.13 miles, because it was hot and humid as balls. However, it was long enough to get a feeling for how the new tires perform on the kinds of surfaces that I ride on. As expected the rolling resistance is a lot less. I was able to push one or two gears higher than previously and didn't run into any traction problems on the hard-pack gravel Forbidden Drive. They performed fine even in looser gravel, though they didn't float over it as well as my original 1.95" wide tires. My average speed increased by about 1 or 2 MPH, compared with previous rides. To see how they'd do, I did take the bike off the gravel onto a dirt trail for about 100 yards. As expected, it was a bit skittish on wet dirt, and the ride isn't as soft as the MTB tires, but it's a good tradeoff for my riding. This morning I put another 8.52 miles on my old Trek 820, along Forbidden Drive in Fairmount Park. Since I'm doing my riding on paved trails or packed gravel, I've been thinking about either replacing the knobby tires on the bike with something with less rolling resistance, or even getting a second set of wheels with faster rolling tires. This afternoon I took a drive up to Indian Valley Bikeworks in Harleysville. At their recommendation I bought a pair of 26" x 1.5" Bontrager H2 semi-slick tires and suitable tubes. I was able to remove the old rubber with one tire lever, and the new tires and tubes went on easily. They are rated for 60 to 90 PSI. I have them pumped up to about 65 PSI, to provide some cushioning. In my old cycling days I sometimes took my 1986 Nishiki road bike with slick 700c x 25 tires at 100 PSI down to Forbidden Drive and as long as I was careful, didn't run into problems. I should be OK with the new Bontragers, which are a lot beefier. 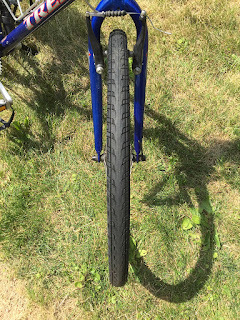 Of course, I'll need to be more careful than with the knobby MTB tires, but converting the Trek into a pseudo-hybrid with these tires should suit my current riding well. I'm still tempted to get a spare wheel set and mount the knobbies on it, though. I am disgusted that FBI Director Comey did not recommend charges be filed against Hillary Clinton. When leaders flout the law, respect for the rule of law by the people soon vanishes. When George Orwell wrote that some animals are more equal than others he may as well have been writing about the USA in 2016, rather than Stalinist Russia. Anyone else who did this would be reprimanded and stripped of security clearance by their department, if not criminally charged. She mishandled classified intelligence and jeopardized national security. She lied about the nature of the investigation (claiming it was a security review, not a criminal investigation). Consider the nature of her actions. She willfully, recklessly engaged in conduct which is statutorily proscribed for good reasons. As someone who's worked with telecom, computer networks, and mail servers since the late 90s, and practiced law before that, I'd be willing to bet my house that at a minimum the Russian and Chinese intelligence agencies hacked her server. That means not only did she compromise national secrets, she is almost certainly vulnerable to blackmail by foreign powers due to the contents of her server. In other words, if she gets elected in November, Putin and others will have the President of the United States by the balls. And yet half the voters in this country are willing to ignore this and cast their ballot for her, just because she is female. Yesterday morning I drove over to Spring Mill and hopped on the Schuykill River Trail again towards Philly. This time I rode in all the way to the edge of Manayunk, a hair less than 5 miles. The first three miles or so are flat, then at Shawmont the trail descends, crosses the SEPTA Norristown/Manayunk tracks, and then runs along the river through a wooded area. The trail through the woods is mostly hard packed gravel with a few paved sections, and several wood plank bridges. This part of the trail has some small hills and nice rock formations to look at. Since it was a nice day there were a lot of people on the trail so I got good practice at weaving among the pedestrians and a few slower riders. Likewise, I had several riders pass me. The return trip was easy except for Shawmont, where I had to drop onto my smallest front chainring to get up the hill. 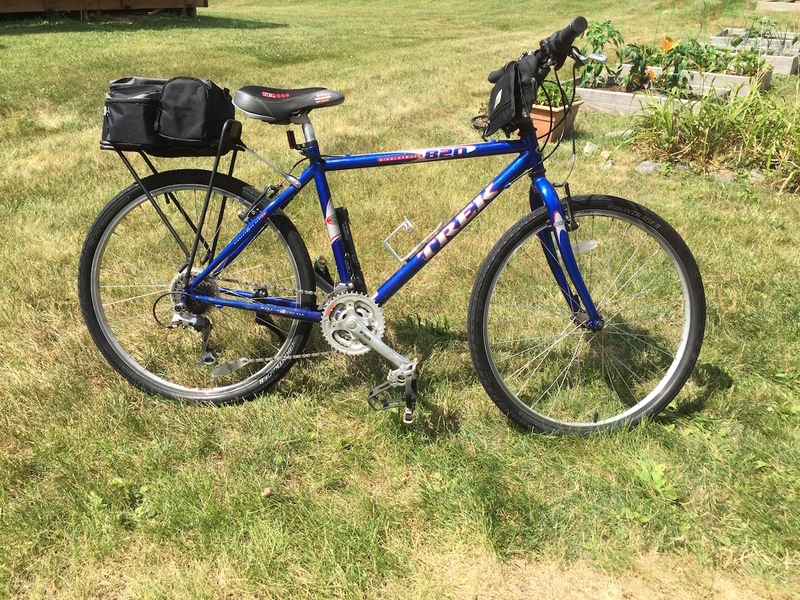 My old Trek 820 is performing well, but I need to adjust my front brakes a little and I think the front wheel needs to be trued. I'm getting a little rubbing. I'm seriously considering replacing the knobby MTB tires with some kind of hybrid tire, for a smoother ride with less rolling resistance. After several rides on Forbidden Drive and the gravel part of the SRT, the Trek was filthy. So, after getting home I wheeled it into the back yard and used a citrus spray degreaser to blow the crud off the chain and derailleurs, then relubed with White Lightning Epic Ride chain lube. It's a "semi dry" lube, so I'm hoping that it'll retain less grit, but be better than a dry lube if I get caught in the rain.